It’s often been said that writing is re-writing. Why then cannot painting be repainting? Because, for some silly reason — like a concert pianist’s reason — we have a need to get it right. When you think about it, a painter has permission to keep reworking a painting until she sees what she wants to see. Lines may be found by many passes. Colours by many swatchings. Did you ever stop to realize that only the originating artist (and perhaps a black light) knows how bad or how different it is under there? Many of us think that the ideal is to make it look like nothing was ever wrong. We labour on the illusion of perfection. “Mine is the horny hand of toil,” said John Singer Sargent, and yet there was seldom an artist whose surfaces looked so effortless. Here are a few ideas for effective reworking that you can live with: It’s generally a good idea to revisit your reference and run scenarios on the cortex canvas. Often, you’ll go for the simplest and most direct solution. Take the time to scrape off, sand down, re-prime. Don’t allow faulty underpainting or unpleasant texture buildup to jinx you. Do your reworking and overpainting with larger, not smaller, tools. Don’t noodle. Don’t panic. Know that persistence is the main virtue. 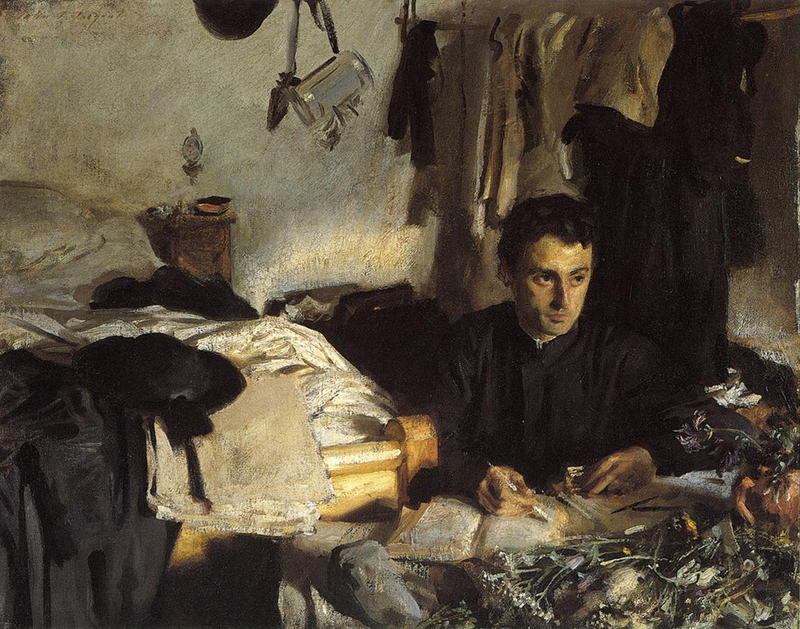 Sargent was apparently a “ragman” — that is he kept putting on and wiping off until he thought it right. Further, try the simple habit of placing the brush at the beginning and moving your eyes to the imagined stroke’s end — then connect. Also, reconsider mixed media — what does it matter — is anything pure anymore? If you’re working in the sanctity of oils and all else is failing, consider the heretic miracle of acrylic — particularly if you change your mind a lot. Isn’t that what it’s all about — changing your mind a lot? This letter was originally published as “Reworking” on February 27, 2001. 1 – To enhance and improve the visual impact of the work. 2 – To fix what is blatantly wrong and bring it up a standard we accept. Artists ‘cull’ we do not ‘throw out’ for we need to overcome dissatisfaction and develop artistic discernment. Is this a ‘cull’ or is it worth working on. Thanks Sara, your Dad encouraged my efforts at my first Art Show in 1979. His contribution of images and words still gives me direction for right ‘Artatude’. Sara, thank you for continuing the work of your dear father in passing along all the wisdom you two have gained over years of working in the arts. It is a true joy to find these artistic tidbits in my in-box each week, and I especially appreciated your dad’s comments today. You enrich our lives, and I am most grateful. Just wanted to add my thanks to you for your inspiring messages. Receiving these pearls every few days really helps me move on in my thinking and my work. Just wanted to say how grateful I am that a friend put me in touch with you. I look forward to your messages twice a week. I am having trouble starting painting again after many years and you are giving me encouragement and inspiration. Thank you. Thank you so much for your articles. I get so much out of them. Whenever my painting doesn’t work I put a light layer of white over it and then turn it at all angles until I see something workable. Art is experimenting until we see what we are after. My medium is watercolor, so reworking is always out. I just have turn the paper over and start again. 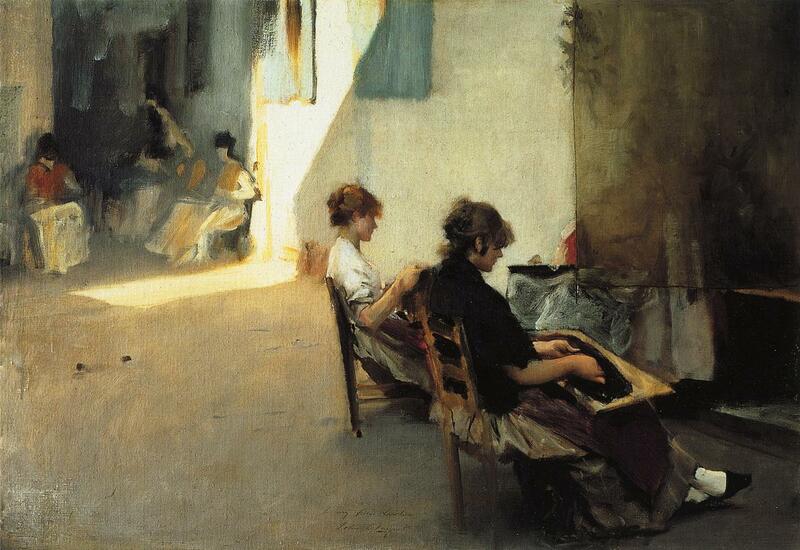 As for Sargent – his ‘toil’ remark may have been at least a bit laced with sly wit – and some of his style at the easel done to entertain his clients, who were paying a LOT of money for the work, and therefore, giving the idea of toil makes the client feel the artist is really earning his fee by the sweat of his brow. Working in watercolor, as I do, a lot – it is often but not always ‘no mistakes’ . If you do a bit every day it is not so hard to THINK then apply the paint with success. If you want to experiment and work with layers, then the painting will be much deeper in effect and not at all what the classic might call a dainty watercolor – lots more passion. I have banged watercolor paper totally witless, just to see if I could get the effect of a deep woods scene – hard for a girl. And once to get the grit in a jazz band group. But such watercolors are often just studies for the more deliberately elegant final painting. Most recently , I have been having fun with water media on Ampersand Aquabord. One can lay in and lift so easily! And no buckling of paper. Wow! A synthetic sailcloth is like that too. And yet the end result is “definitely the water” . Thanks for the inspiration AGAIN as usual . We will meet yet. I’d even recommend to leave out the re-priming after the scraping down. Eventually, you end up with a layered painting which is more than the sum of each layer. ” rest” during their production while they are being reconsidered and reworked in my brain! I am not well off, but I turned down a significant amount of money because I refused to compromise my standards. Some will no doubt think that was stupid. idea in japanese aesthetics. Your work speaks to the buyer just as it is. Thats a surprise you didn’t expect. Why not let it go home to them? Insightful, inspiring, and a great choice in Sargent…..and love the quotes. Always helpful. Sometimes I have to turn paintings to the wall……wait awhile, take another look and see what I can do to correct and complete…….but sometimes I just know and its scraping, sanding, putting down gesso and giving it a fresh start altogether. I very much can relate to the Matisse quote….I’m working toward that effortless quality which Sargent does so well. Its a big learning curve. Thank so much, as always. Thanks for the fabulous insight provided and the opening of my eyes to art. As a beginning in acrylic I am a sponge for all information. ? I am wanting to know if and how I can paint over an acrylic painting that I varnished with a gloss spray. I want to paint over the sky and wanting to know if it is possible after varnishing?